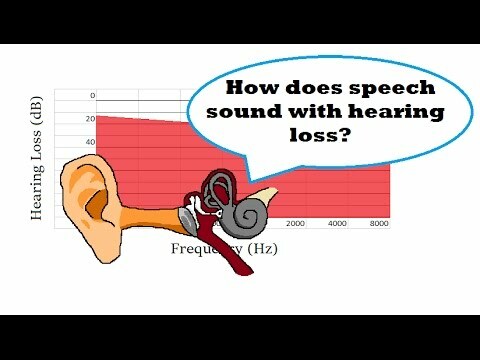 Alright, so let me show you how sensorineural hearing loss works and how it affects you. So we start off with a normal audiogram, as you can see here. As you can see, there are zero decibels of hearing loss across all frequencies. This is why you can hear me very clearly; you can hear all the consonants and all the words in my speech because there is no hearing loss at any frequency. Now, if you start to expose yourself to some loud noise, maybe not a lot, but just enough to cause a slight bit of damage, you will start to experience slight hearing loss. I am simulating here a 4,000 Hz 10-decibel reduction. It could be 3,000 Hz; it could be 6,000 Hz; it could vary, depending on person to person, but very commonly it falls around the 4,000 Hz range, and you’ll start to hear something like this at a slight 10-decibel hearing loss. Now, as you continue to expose yourself to loud noise, this will get worse. You’ll start to fall under what is called mild hearing loss. Now there is nothing mild about this. Yes, they term it mild hearing loss because it can be much worse; however, the effects of it are quite severe. As you can see here, there is a 30-decibel reduction at the 4,000 Hz range. And, although it is only a 30-decibel reduction, it is definitely enough to affect the quality of the speech. As you can tell, what I am saying sounds a lot muddier. It is not quite as crisp and clear as it was before, and in a noisy situation, it would be much more hard to understand what I am saying. Now if you continue to expose yourself to loud noise, of course, this is only going to get worse. The dip at the 4,000 Hz range is gonna dip even further down. We are simulating a 50-decibel reduction here, at the 4,000 Hz range. As you can also tell by the graph, the reduction is starting to spread into the other frequencies around it too, causing you to lose hearing in all frequencies, just more particularly at the 4,000 Hz range. At this moderate hearing loss level, speech is becoming harder to understand, and you are having to focus more on what I am saying. You can probably still understand me, but it is not as easy as it was, and you have to focus hard. This can get very tiring throughout the day, and in noisy situations, it is getting almost impossible to understand speech. If we continue to increase the hearing loss to 70 decibels at 4,000 Hz, we fall into what is known as a severe hearing loss. At this point, speech is almost intangible; what you do hear is mostly vowels, there are hardly any consonants in what you are listening to because most of those consonants fall around the 4,000 Hz range. And if you have a lot of loss in that range, you are not going to hear those consonants. You are mostly going to hear vowels. So speech is going to sound mumbly and muffled, and it will be very difficult to understand. Unfortunately, this can get worse if you keep exposing yourself to extremely loud noise. Eventually, you are gonna fall into what is known as a profound hearing loss. This is at a 90-decibel reduction at 4,000 Hz. You can barely understand anything I am saying; it is mostly mumbling, and you pretty much are not hearing anything except the low tone vowels. This is not ideal by any means. It is almost impossible to carry on a normal conversation this way; you will have to shout or speak very loudly to be able to understand people at this hearing loss. And, hearing aids are nearly a necessity well before this, if you want to hear a speech. So don’t ever let your hearing progress to this level. Ever. Because once it gets down to this level, there is no turning back.